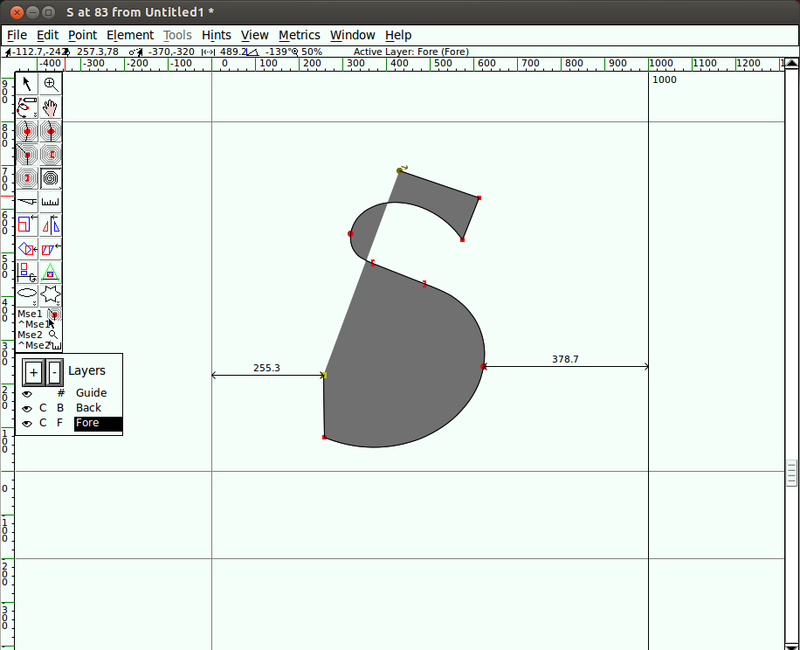 Spiro is a toolkit for designing curves in an alternate method to the more traditional Bézier curves. 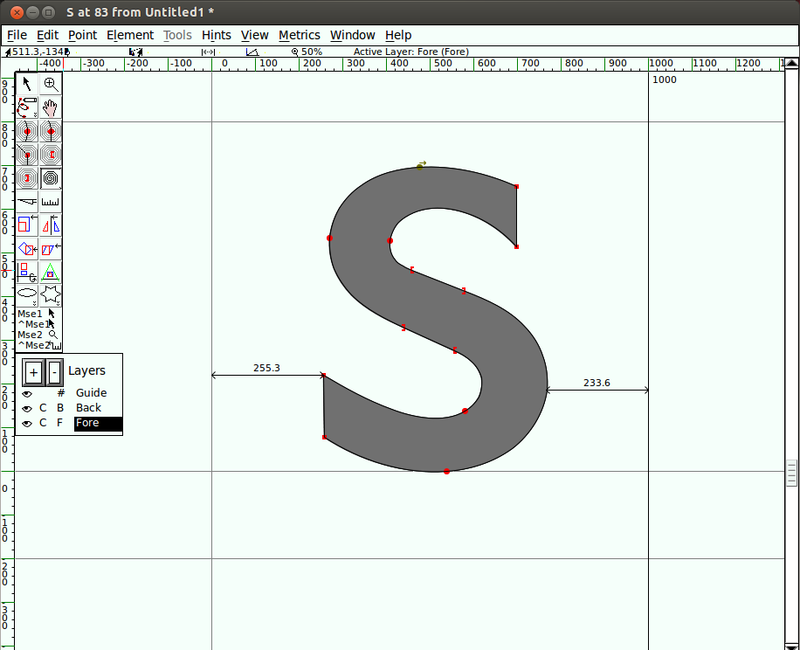 Although it is optional, FontForge can be installed to include a Spiro mode that offers you tools to create these specific types of curves. 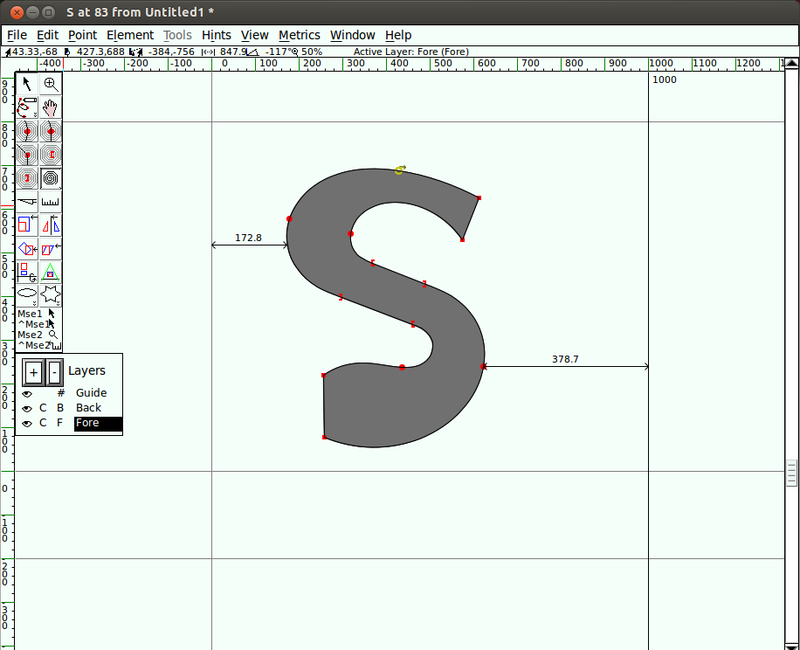 See the chapter of Installing FontForge for more detail on how to install Spiro tool support. 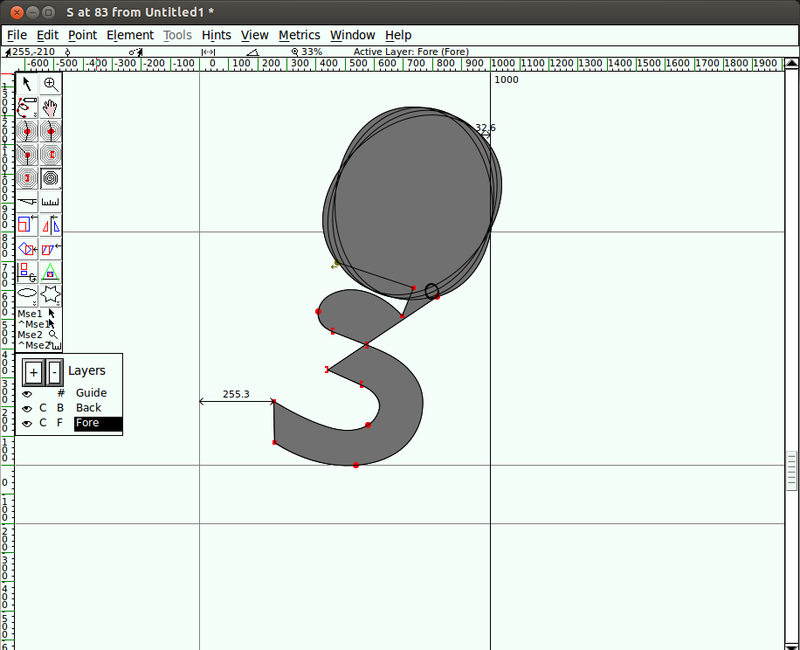 Spiro drawing is different, but it can create curves in a way that Bézier tools cannot, and it can solve problems that other drawing methods cannot. Spiro can be a very cool tool to use. Please experiment! Many of the same drawing tools are available in Spiro mode as those described in the "Using the FontForge drawing tools" chapter, but some of them work very differently when you are in Spiro mode. Going through the exercise of drawing an 'S' with Spiro will make you comfortable with Spiro. Tip: When drawing in Spiro mode, always start with a G4 or G2 point. Beginning with the other types of points doesn't really work in FontForge. Start off with a G4 point at the topmost point of your 'S,' followed by a corner point, then another corner point. Work clockwise around the shape of the letter. Follow this with a G4, a previous constraint point, and a next constraint point. Next, add another G4 point, followed by two more corner points. 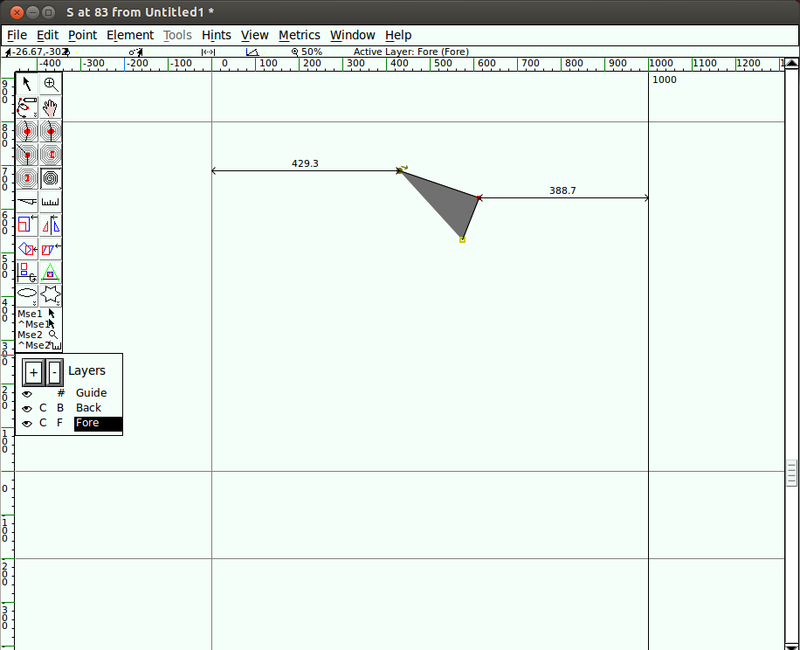 Then a G4, followed by a previous constraint, followed by a next constraint. 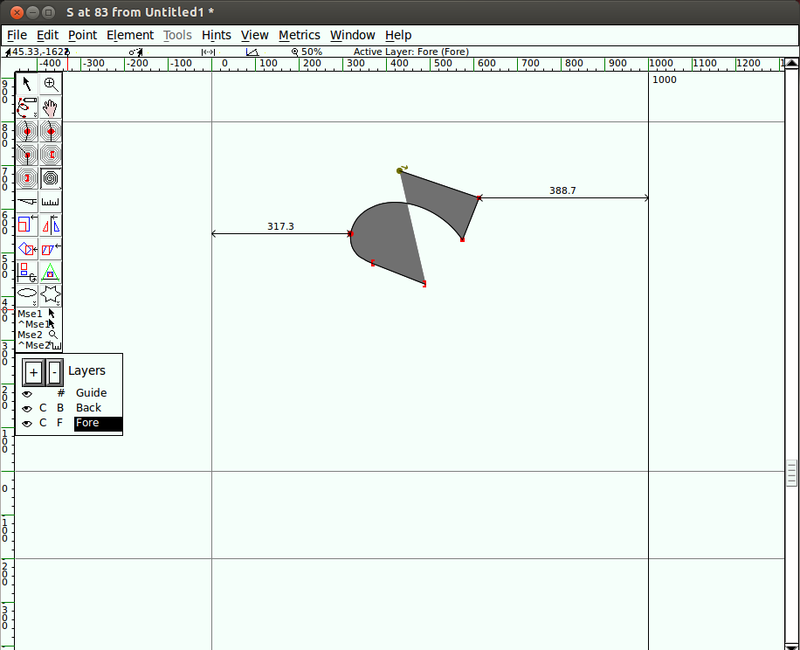 Then, add one more G4 point, and, finally, close the shape at the starting point by clicking on it using the G4 point tool. Now you almost have an 'S'! Begin nudging the points around to get your S to look the way you like it. Don't worry -- Spiro sometimes does some funny things. Just hit Undo, or keep nudging the points to get things back on track. Toggle out of Spiro mode back into Bézier mode. You will notice there are a lot of points on the resulting curve - you -may want to clean some of them up. You can continue to experiment with Spiro mode to get a feel for how it differs from Bézier drawing. The terminology is different, but as is the case with FontForge's other drawing and adjustment tools, practice makes perfect.